For recreational whale-watchers and serious marine researchers alike, the waters surrounding Victoria, BC, are a choice destination. From spring through fall, southern resident killer whales from three pods comprising approximately 80 whales are frequently seen in the protected waters of the Salish Sea. Members of another community of killer whales, called transients, also appear often in the Salish Sea. Numbering more than 250, transients tend to travel alone or in small groups up to five individuals. Killer whales can grow to a length of nine metres (30 feet) – nowhere near as large as my GPS doodle, which measures more than six kilometres (20,000 feet) from the tip of its rostrum (snout) to its tail. 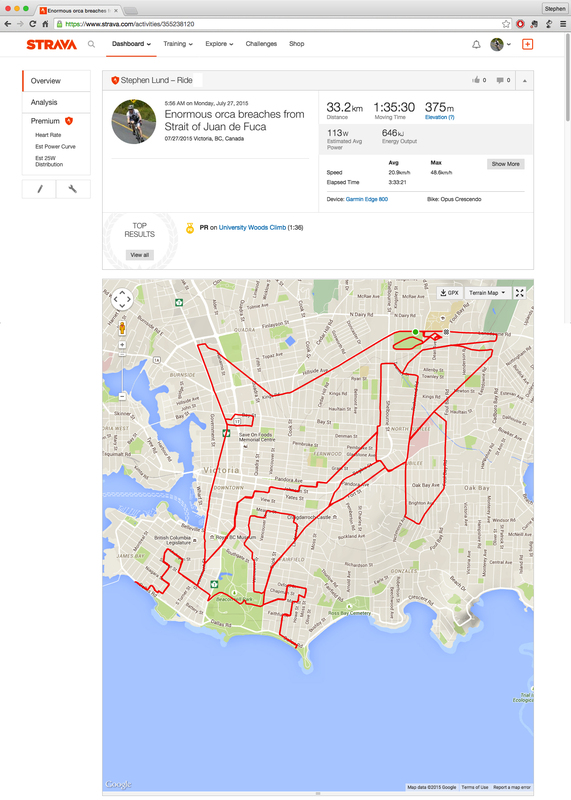 This entry was posted in gps art and tagged creativity, cycling, cyclist, garmin, gps, gps art, killer whale, marine biology, orca, Salish Sea, strava, street art, urban art, victoria bc, wildlife. Bookmark the permalink.